Fifty one years later, the forces of war and militarism are still strong – propelled by the events of 9/11– just as the Vietnam War was propelled by the false story of the Gulf of Tonkin Attack and the Domino Theory (the 1960's version of the "Global War on Terror"). In an echo from the events of the past, on October 20-21 the Women's March On The Pentagon will take place and then a few weeks later on November 10-11 Celebrate Peace: Armistice Day 100th Anniversary (Veterans Reclaim Armistice Day marches and activities) events will be sponsored by World Beyond War. 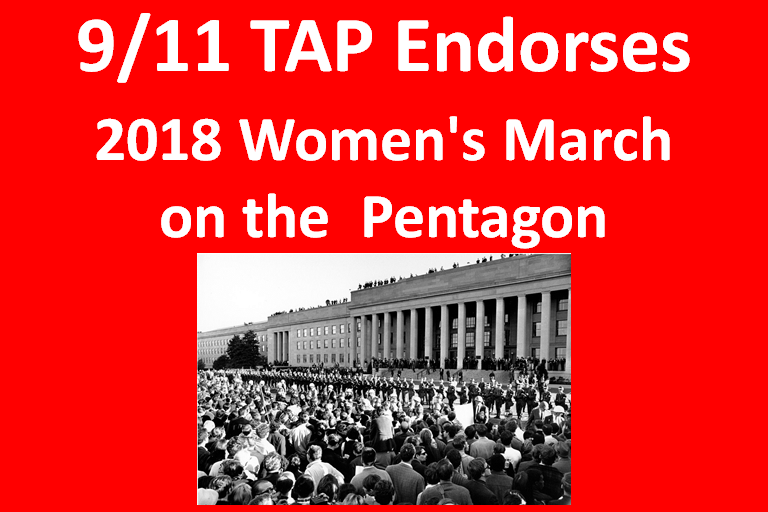 The 9/11 Truth Action Project supports the efforts of the Women’s March on the Pentagon and World Beyond War in their activities. We encourage all people interested in supporting these events – either in Washington or in their home communities – to join the chorus. On the seventeenth anniversary of September 11, 9/11 TAP organized over a dozen vigils around the country. Now just six weeks later, another anniversary is calling for solidarity and outreach regarding the cost of the wars in moral, physical and financial terms – plus an opportunity to educate the people about the events of 9/11 and inform them about the inadequate investigation into 9/11 that has propelled these wars. Once educated, they will demand answers to what actually happened before, on and following 9/11 – undercutting the basis for these wars. Questions about 9/11 have relevance today – as exemplified by the U.S. Senate passing resolution SR 610 introduced by Senator Blumenthal just 13 days ago. This resolution, passed unanimously, called for the broadest possible declassification of 9/11 documents. The next step in Congress is for the House to pass the companion resolution H.Res 663. If marches, rallies or vigils are not yet organized in your local communities to support the Women's March on the Pentagon (check here), the 9/11 Truth Action Project will help by offering support to local organizers to reach out to groups like anti-war, citizens rights and first responders. If you want to help, contact 9/11 TAP at Vigils [AT] 911tap [DOT] org.